Click the New.. button. In the Name field, type ExtAIR as the name for the new profile. Then click OK.
Click the Add Library button. From the Library drop-down list, select AIR. Then click OK. Select profile ExtAIR then click the Add Library button. 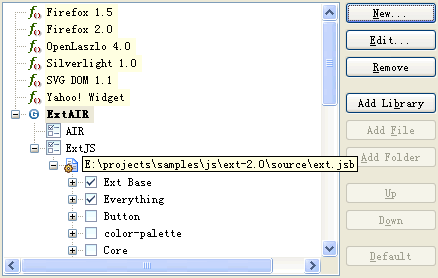 From the Library drop-down list, select ExtJS. Then click OK. Select the ExtAIR profile created in step 3, click the Default button make it the default profile for all project. The default profile can also be configured per project by using Configure Project Specific Settings... link.